We all know that the Project Management Body of Knowledge (PMBOK®) 6th edition will be launched in this July. From the new PMBOK®, we can expect considerable changes in every aspect whether it’s an exam, training course, or anything related to PMI. The PMI defines the role of project manager in every industry and help us to identify the knowledge areas that we need to perform in our jobs. For starter project managers, the 6th edition validates the requirement for the Talent Triangle, which means the project managers must have knowledge in business management, technical project management, and strategic & leadership. In this edition of the PMBOK, inclusion of Agile practice will be the major addition and will have a great impact of PMI certification courses. The first 3 chapters of the book have been completely rewritten to highlight importance of project management’s role in the business value creation and any organizational change. Agile concept is incorporated in all 10 knowledge areas. Due to these changes, project managers need to gain knowledge form Agile Practice Guide along with the PMBOK®. All 10 knowledge areas will focus on new topics like Key Concepts, Approaches in Agile, Tailoring Considerations, Trends and Emerging Practices, Iterative and Adaptive Environments and so on. In the new edition, the role of the project manager has been expanded as a leader, business expert and strategic thinker. Included a new business case in the initiation and the requirement for the project management plan benefits. The ‘Project Human Resource Management’ module has been renamed to ‘Project Resource Management’, so that it can include both physical and human resources. Renamed ‘Project Time Management’ with ‘Project Schedule Management’. Three new processes have been included naming Implement Risk Responses, Manage Project Knowledge and Control Resources. Close Procurements have been removed from the book because studies suggest that project managers usually don’t close contracts. 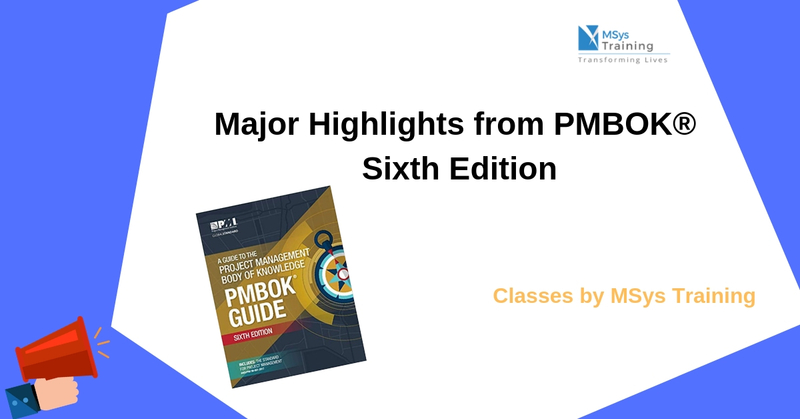 Although, PMBOK is releasing in 3rd quarter of 2017, PMI will permit current PMP® participants to continue taking an exam based on the current version that is the PMBOK® 5th edition for up to half a year. Which means the PMP® exam based on the PMBOK® 6th edition will be conducted in the first quarter of 2018.